The Nourishing Homestead: One Back-to-the-Land Family's Plan for Cultivating Soil, Skills, and Spirit by Ben Hewitt, with Penny Hewitt, Chelsea Green Publishing, 352 pages. $29.95. "The soil is your gardens' heart, lungs, and nervous system," writes Ben Hewitt in his new homesteading guide. Published by White River Junction's Chelsea Green, The Nourishing Homestead: One Back-to-the-Land Family's Plan for Cultivating Soil, Skills, and Spirit details many of the hands-on logistics of the lower-income-and-lovin'-it rural lifestyle that Hewitt described in his previous book Saved: How I Quit Worrying About Money and Became the Richest Guy in the World. The Cabot-based author draws on the nearly 20 years of experience he and his wife, Penny, and their two sons have had on their 40-acre homestead. Their results, and the honesty with which Hewitt shares their successes and difficulties, are impressive: The family raises 90 percent of its own food, and gathers wood for heating and building purposes. Full of advice, information and asides, the book has a back-to-the-land angle reminiscent of DIY volumes of the '60s and '70s. Yet Hewitt's homesteading lexicon is, thankfully, of this century. He challenges the individualistic rhetoric of "self-sufficiency" common in other homesteading how-tos, instead writing passionately about his practical and political need for others. "The more interdependence we develop with family, friends, neighbors, and community, the less dependent we become on institutions far beyond our sphere of influence," he writes. The book introduces the term "practiculture," Hewitt's neologism for the combination of organic, biodynamic, bio-nutrient-rich and permaculture farming methods his family synthesizes. Not for nothing does the title echo that of Sally Fallon's 2003 cookbook Nourishing Traditions. Hewitt, like Fallon, adheres to the nutritional principles of Weston A. Price, which dictate a diet rich in pastured animal products and fermented vegetables, and low in sugar and grains. Among environmentalists and homesteaders, there's heated debate on the appropriate role of livestock on farms and in our diet. Hewitt's respect for his animals' utility and tastiness comes from his experience integrating them into nearly all aspects of his homestead, which he dubs Fat O' the Land Farm. The Hewitts' cattle, sheep, chickens, goats and hogs provide meat, fat, dairy, eggs, fiber, insect control, fertilizer and mowing and land-clearing services — not to mention companionship and cute photo ops. Hewitt makes a strong, impassioned case for keeping pastured livestock, without vilifying vegetarians — though he doesn't address the question of methane emissions from ruminant animals. Hewitt's pursuit of health is central to his homesteading practice. He connects soil health — with particular regard to microbes and trace minerals — to the vitality and nutritional value of his crops, and thence to his family's health. The book's section on soil remineralization is fascinating, and Hewitt's primer on trace-mineral soil applications goes far beyond conventional considerations of nitrogen, phosphorus and potassium. Despite its wealth of information and some poetic philosophizing, the book drags when Hewitt occasionally seems to forget his audience. He spends pages preaching against the mainstream capitalist economy, processed food and Big Bad Pharma — wasted effort, given that most readers interested in homesteading already have similar convictions and concerns. In addition, the lack of nuance with which he describes Western medicine could grate on readers who have benefited from, say, contraceptives, a polio-free childhood (thanks, vaccines!) and life-saving prescription medicines. Still, the book's value as a resource easily outweighs its flaws. The details and contents of Nourishing Homestead far exceed what can be covered in this article and are judicious in their breadth. It's peppered with dozens of tip-filled sidebars, including garlic-harvesting ideas, a bacon-making how-to, and forestry advice with future firewood in mind (plant black locust). Hewitt's guide to evaluating the edibility of roadkill is concise, practical and funny: "What I like to see in cold weather is a body that's still limber and maybe even a little warm. That's a sure sign it was a recent hit." Hewitt admits to being an extreme homebody — raising all those animals takes time — and notes that his family hasn't spent a single night away from the homestead together in seven years, despite an interest in travel. For would-be homesteaders with even a drop of wanderlust, this is no easy model to emulate. Seven years without a weekend in nearby Montréal, New York City or the home of an out-of-state friend may seem like a state of disconnection from the broader array of people and cultures outside rural Vermont — one that risks thickening into insularity. For a writer to put his or her home life, family, finances and personal choices on the printed page — inspiring readers and inviting their scrutiny — is risky and admirable. 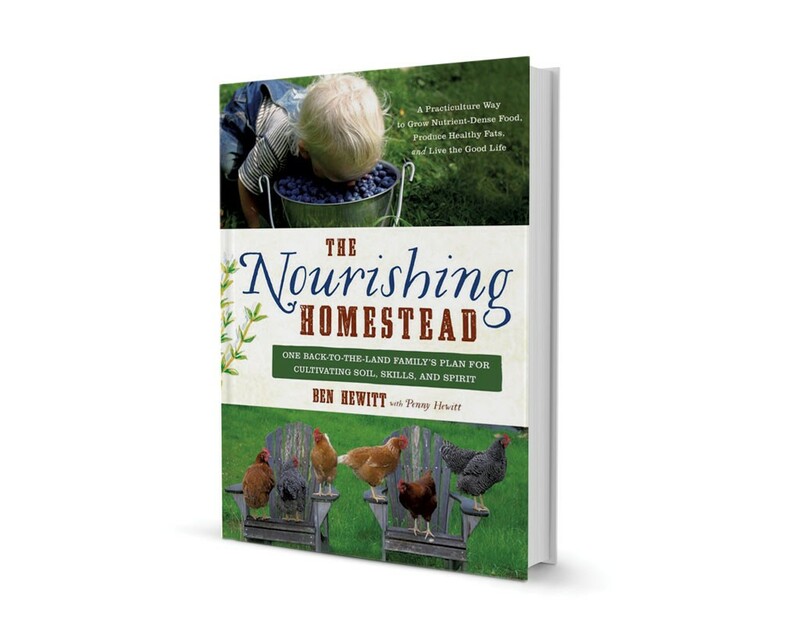 Written mostly in narrative form, Nourishing Homestead is more personal than many homesteading guides, which tend to be organized around project-based how-tos. Although Hewitt takes care to note that the choices he and his family make are not necessarily the ones others should make, Nourishing Homestead sometimes reads like How to Be Ben Hewitt. That could be just what readers devoted to his previous works have been hoping for. Hewitt will speak about nutrition on Tuesday, February 24, 6:30 p.m., at the Davis Auditorium, University of Vermont Medical Center Campus, in Burlington. The original print version of this article was headlined "Home Sweet Homestead: Ben Hewitt's 'Nourishing' Guide to Living on the Land"